The Giving Gap has implications for our funding systems and measuring impact, including the reasons that people do not donate to culture, and motivators for those who do donate. 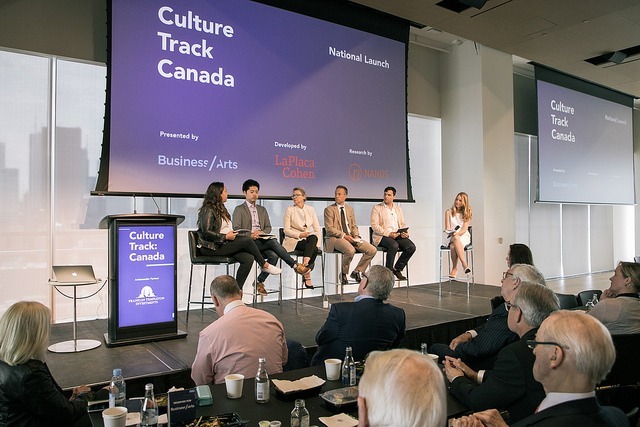 In June, the first Culture Track Canada report was launched. Originally tested in the United States, this study on cultural participation – motivators and barriers to participation – was proposed for Canada. A Canadian version of the study was developed for the Canadian context with multiple advisors from the arts, business and public sector in Canada, led by Business and the Arts with endorsement and investment from the Canadian Arts Summit delegates, business partners and public sector stakeholders, and conducted through La Placa Cohen and Nanos Research. Section six of the report in particular, The Giving Gap, (Page 36 to 42) has implications for our funding systems and measuring impact, including the reasons that people do not donate to culture, and motivators for those who do donate. So how are donor trends linked to public policy, and how can these findings prompt strong advocacy efforts? The largest reason (30% of respondents), for not donating to culture was that, “my taxes already help.” The general assumption here is that citizen engagement toward funding culture risks being seen as an either-or – either I donate my money, or my money goes to government for culture to be taken care of. It is also worth noting that this response was driven primarily by the older generation, an interesting consideration when reflecting on the history of cultural policy in Canada. This generation experienced the government-led Massey Commission (aka. Royal Commission on National Development in the Arts, Letters and Sciences) to fund and support culture from 1949 onward, and experienced neo-liberal policy shifts from the 1970s onward, which gained momentum in the 1980-90s. In today’s reality, we know the Canadian arts and culture sector relies heavily on both public and private dollars, and we still try to contextualize our unique national environment for funding in comparison with the high level of private funding for culture in the United States, or the strong foundation of public cultural policy supports in the United Kingdom and Europe. How does funding flow in the sector? How is it used and what impact does it make? Why and how should such critical revenue sources be retained and/or grow? While donor dollars sometimes come with restrictions attached, they are mostly put into general revenues for cultural organizations and contribute to unrestricted spending for key expenses – like operating costs and ongoing programs. Fundraising and development then needs to account for two dialogues: the first toward building donor literacy to increase understanding of the realities of the public funding environment and the critical use of donations. The donor environment seems ripe for this dialogue, as 60% of Culture Track respondents said they donated because they knew the organization needed financial support, and 38% were worried about the organization’s funding. The second dialogue, which takes place with individuals and agencies who develop and administer public funding, should address how their policies complement (and are unique from) the wide array of revenue sources that make up an organization’s budget. There is already an appetite in government to understand how a sector functions, and government officials often ask about the different players and funding systems and how they are interconnected. These dialogues take place mostly through one-on-one meetings and through government committee studies. Further, organizations that submit policy briefs have another opportunity to lay out the landscape for decision-makers. When participating in public policy, there is much to unpack about the Canadian cultural funding environment – it is distinct from many other sectors, with its own unique challenges in direct government and arms-length funding, patronage and donations, corporate sponsorship, copyright royalties and levies, earned revenue on products and services, and more. As an added enhancement to these dialogues, the Culture Track study notes that Canadian donors are primarily motivated by social impact – the organization’s mission, the connection to community, and ability to affect global change. Over the past 10 years in particular, we have noticed an advocacy trend in collecting and articulating the economic impact of culture. That is, measures such as jobs, gross domestic product, offshoot revenues to business, etc. It is now a norm to try and articulate economic impact, although there is still a long way to go in data collection on these measures. At Global, we continue to encourage clients to put forward evidence-based policy positions, and the economic impact acts as an integral component. The next major step in articulating overall impact, is to become good at measuring and communicating the social impact component. Describing the value of an artistic experience is hard enough and, like evaluating cultural impact, social impact can be amorphous, highly contextual, and not easily quantified. Further, as public funders assess a wide range of funding applications under their own standard assessment framework, it can be challenging to compare qualitative social impacts between applicants in a competitive process. Take a look at how economic and social rationales are framed in some of the upcoming pre-budget 2019 submissions. In closing, research is only as good as its use. We have been following Culture Track for some time, and are grateful for the chance to reflect on the findings in a way that helps advocates articulate their work, and to enhance dialogue with public and private funders. For more information on Culture Track Canada please visit the Business and the Arts website. Thank you to Business and the Arts for sharing some of the Culture Track Canada data and for their input in writing this piece.